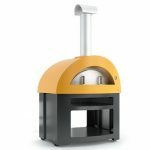 AlfaPizza are already recognised as being one of the front-runners in pizza oven manufacturing and that brilliance comes from the fact that they are made in Italy, a very fitting fact since you are looking to find a pizza oven that can create the best pizza that you have ever tasted. The AlfaForno Allegro is certainly to be considered as a top of the range outdoor wood fired pizza oven and with great reason, the sheer quality throughout both in terms of how the oven is made through to the cooking experience that you get when using one of these state of the art outdoor ovens is simply unrivaled. If you consider yourself to be a budding pizza chef and want the best possible cooking environment to showcase your creations, look no further than the AlfaPizza Allegro, available in both red and yellow finish to add even more style to your outdoor dining space. When you pay a premium price, you expect the quality to be significantly higher than other products on the market and with AlfaForno Allegro you get just that, with a breathtaking 350 degrees cooking heat possible in as little as 10 minutes, three times faster than our previous best rated outdoor oven! If you are looking for a pizza oven that can deliver unrivaled crispy bases, fantastic smokey taste and handle a larger cooking volume for those bigger outdoor dining gatherings, you are looking at one of the best on the pizza oven market today. To give you a little more insight into what the AlfaForno Allegro can achieve, we put it to the test and we were able to cook 18 pizzas in just 15 minutes thanks to the 100cm x 70cm cooking surface. They say that money can’t buy happiness but this truly was one of the most enjoyable tests that we have ever done, so even with a price tag at over £3,000 this has to be a real option for those that are looking for the wow factor in both the cooking and visual categories.